Morning morning oats here we come, as I wake from my slumber I find myself looking forward to the morning treat that I’m about to prepare for myself and this morning was no different! So I thought I would share my excitement with you. I have just made myself the most incredible bowl of porridge oats with cinnamon and raisins and I’m sitting here smiling to myself at how nice it is! Not only can oats taste good, they are one of the best sources of dietary fibre and being wheat free, they suit a fussy foodie diet down to the ground. Oats are a key source of dietary fibre, in particular a soluble fibre called beta-glucan which is proven to help cholesterol levels, removing cholesterol from the body which would otherwise end up on the blood stream. The beta-glucan in oats is excellent at controlling blood sugar levels. It slows down digestion and prolongs the absorption of carbohydrates into the blood stream, preventing the dramatic changes in blood sugar levels which can lead to cravings and energy loss. The carbohydrate content of oats help to maintain a steady energy level, which is particularly beneficial when playing sports. Oats are a great source of anti-oxidants, removing those nasty free radicals that can build up in your body. Oats provide an essential supply of fatty acids & amino acids as well as being a good source of essential vitamins such as thiamin, folic acid and vitamin E. They also contain zinc, magnesium, manganses, selenium, copper and iron. So in short oats should definitely be a staple part of your diet, with some advice recommending we eat 1/3 – 1 cup per day. Add the ingredients to a saucepan and boil gently until the porridge becomes the desired consistency, try to stir continuously to prevent sticking and lumps. Leave to cool slightly so its a palatable temperature. Add cocoa powder during the cooking process to create an amazing & comforting Cocoa Porridge. Add cinnamon and raisins (if desired, or any dried fruit of your choice) during the cooking process to add a wintery, christmassy feel to your porridge! After the porridge has cooked and cooled slightly, stir in a handful of mixed seeds to get the extra boost of goodness. 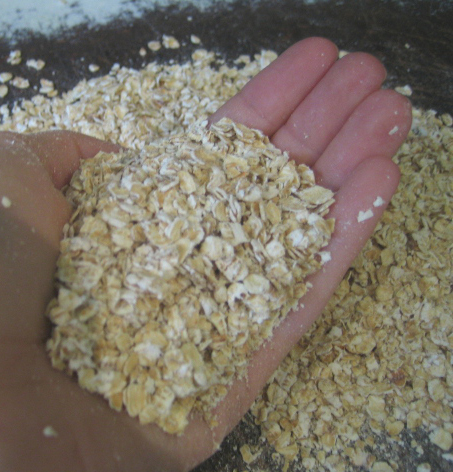 To make your oats richer, substitute the 1/3 cup of hot water for 1/3 cup of milk of your choice. For complete indulgence (and a very occasional treat!) substitute some of the liquid for coconut milk and sprinkle in some dessicated coconut too! Oats are so versatile, making a great morning breakfast as well as being an ingredient in many recipes – keep a look out as we will be adding more oat ideas soon! Mmmmmm just trying the wintery porridge option with cinnamon a few raisins… tasting good! Actually I think it tastes good with just the cinnamon and as raisons are high in fruit sugar I might just leave these out next time.